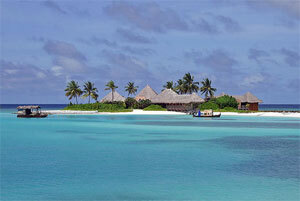 The Maldives are a string of 1,200 islands southwest of India. The country has the geographic distinction of being the nation with the lowest high elevation, a mere six feet above sea level. Because of the current and projected rise in sea level due to global warming, combined with predicted stronger monsoons, there's a real possibility that the entire country could simply disappear under the waves. What to do? Mohamed "Anni" Nasheed, the new president of the Maldives, is considering an extraordinary plan. He wants to move the entire nation...every man, woman, and child...to higher ground. Nasheed is proposing using a portion of the billion dollars the Maldives takes in each year from tourism, and buying land in India, Sri Lanka, or maybe even Australia. It's unclear how much land will be needed to hold the nation's 270,000 citizens, or whether the host nation will allow another sovereign nation within its boundaries. What is is that Nasheed take the possibility of his country washing away very seriously. Sixty-nine Maldives islands were completely submerged by a monsoon four years ago, and he thinks things will only get worse. "We do not want to end up in refugee tents if the worst happens," Nasheed says. Here's a CNN article on the plan.